Annotate your numbers with words, so that they make sense to you. Soulver picks out the numbers and calculates your answer as you type. Do calculations over multiple lines, and refer to previous lines, much like a spreadsheet. 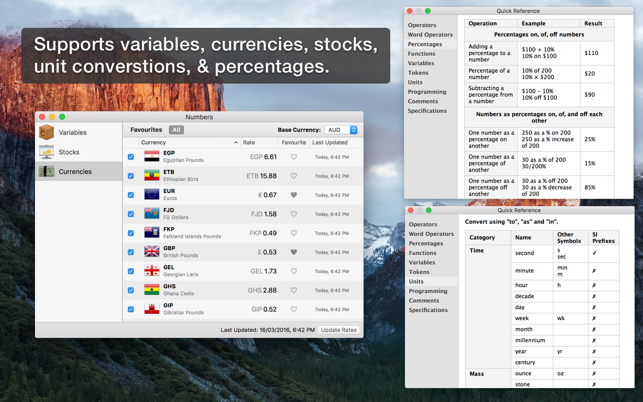 Soulver is great for adding things up, doing all kinds of percentages easily, and converting things, like currencies. It's quicker to use than a spreadsheet, and smarter and clearer than a traditional calculator. 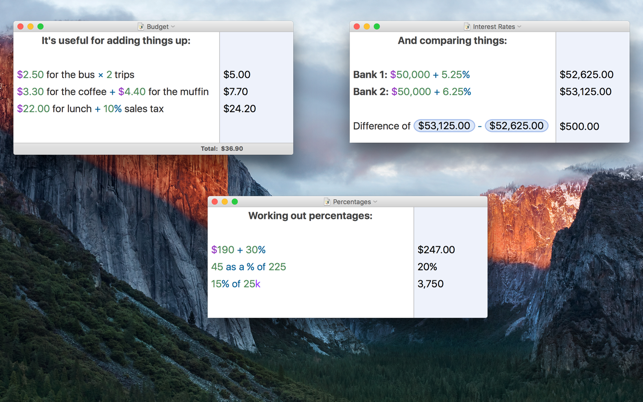 - A text editor for working stuff out & doing quick calculations. - Refer to previous lines using tokens. - All standard mathematical functions. - Support for calculations in binary & hex. - Save your work & sync via iCloud to the iPhone & iPad versions of Soulver. - Export into PDF & HTML emailing. - Support for Resume & Versions. – A crash related to opening files created on Soulver for iOS in European locales. 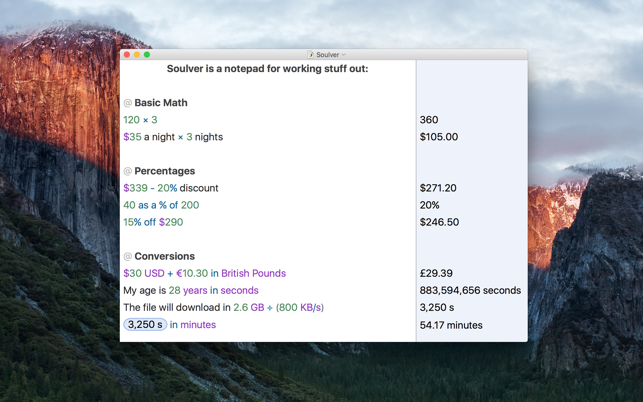 On macOS and iOS, I always reach for Soulver before any other calculator app, and almost always instead of opening a spreadsheet. Another reviewer described it as "Mathmatica lite" which is just about perfect. I might also say Like a Jupyter Notebook for basic arithmetic — although that might even be selling it a little short. Let's just say it's truly great and very handy and I rarely find myself wanting to use anything else when it comes to juggling numbers. Very nearly perfect. I’d love to see a ‘draw a line under this’ feature so I could kind of checkpoint the running total figure at a certain stage and then start fresh on the next line. I tend to use this as an always-open scratchpad which I can refer back to during the day; unfortunately having a single running total number doesn’t make sense in that use case since my calculations are not related. I don’t really want multiple windows open since I just want to get in it quickly. I’ve used Soulver for years and it’s a fantastic tool the entire time. I use it every single day for school or family finances. Other classmates have been blown away by how easy it is to use and how much easier it is to make calculations and formulas than Excel. Thanks, Soulver!